Hello, let me introduce myself. 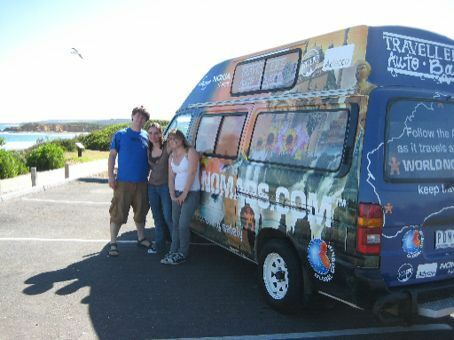 My name is Robin, I’m a 25-year-old magazine editor from New York City, and I’m traveling in the World Nomads ambassador van with my brother, Jeff, and his girlfriend Crystal. Back in September I left New York and all that came with it — job, friends, low-rent apartment— to travel Australia on my own. So far I’ve spent multiple weeks in both Melbourne and Sydney, and I’ve done the East Coast backpackers trail, all the way up to Cape Tribulation. What I haven’t done, however, is drive. And uh, camp. It’s not something I “do,” first off, let’s get that straight, so the fact that I’m lying in a campervan bed with a mosquito buzzing persistently around my head in the middle of the wilderness somewhere outside Lorne, VIC, is a big deal. But I wanted to do it — I wanted to try this camping thing — and I wanted to do it in one of the most beautiful countries in the world: Australia. My brother and Crystal, however, have lives and jobs and things to go back to at home, but they decided on a whim to come do this trip with me. I’m very grateful, because believe me when I tell you they could be on a cruise somewhere in the Caribbean right now. Instead, they’re in a tent. Thanks guys. So here we are: Day 1. After a sunshiny two days puttering around Melbourne, we picked up the van this morning and set off for the Great Ocean Road. I’d actually done part of the GOR in September, with a girlfriend of mine and a few friends of hers. Back then, all you could see was green, green, green. The outlying scenery around Melbourne looked different this time — it’s summer and it’s brown. This was the Australia I’d heard about. Desert, the harsh outback…let me tell you, it really puts those 4-minutes showers into perspective. We spent the next hour gazing outside at the landscape. Tractors dotted the landscape as the buildings and warehouses started to disappear, but before we knew it we were in Victoria’s second largest city: Geelong. Here’s what I know about Geelong: 1. They won the Aussie Rules Grand Final in September by, well, a lot. 119-36, or something embarrassing like that. Sorry Port Adelaide; 2. One of their star players, Jimmy Bartel, won the Brownlow, the most presitigious footy award you can get. He’s also adorable; and 3. The National Wool Museum is in Geelong. Well, sad to say we gave the National Wool Museum a pass, but we did drive through the city center to take a look. The water surrounding the pier sparkled as if to welcome us to the countryside; when we left Melbourne it was grey skies above, huge rolling clouds moving in ominously overhead. But here, here down at the gorgeous pier, the Great Ocean Road beckoning, it was as clear as can be. With weather like that, we were anxious to be on our way, so after a mandatory groceries stop we set off for our first “real” stop of the day: Torquay. I remember Torquay from September. It felt miles and miles away from civilization; vacation season hadn’t really started up yet, and the rugged coastline was free of screaming kids and adventurous bodyboarders. Now, in summer, it was packed. Families and sunbathers dotted Main Beach, while surfers caught massive waves off the beaches to the west. This is the surf coast, you know. We rocked up to a grassy knoll, popped out our PB&Js (American pride!) and admired the view. The water was aqua blue, the kind of colors they use for the “mint gel” flavors of toothpaste. We left not long after, but not before Jeff and Crystal managed to find some time for swings. “A rule,” he said. “Where there are swings, one must swing.” They swang. Next stop: Point Addis. Only 8 Ks out of Torquay, we swung a quick left and meandered down a long, winding road until reaching our prettiest destination of the day. Glistening water, huge sandstone cliffs and not a soul out there. Paradise on the Great South Way. If we could have stayed there, we would have, because what a sunrise that would be, but our goal for the day was to make it to Lorne, my first and only overnight stop when I came down here last time. Then, however, I was staying in the Lorne hotel for $50 p/night. Now I’d be camping. And so it goes, our little Nomie made it up the ridiculous hill into the mountains behind Lorne and into our campsite for the night. Pasta dinner courtesy of Crystal, and now here I lay: my first night out in the Australian wilderness. Yeah, I’ve been here four months, but it’s nothing like this. Welcome. It should be an interesting four weeks. And now I’m going to go murder this d*$m mozzie. Happy travels & remember to check the oil! Well, hope walking upside-down at the bottom of the world is fun. Looking forward to more blog reports from you guys. Give Crystal a noogie for me.